WE just had TWO slots open for this last minute…. email deek- kidcedar at gmail.com if interested…. This workshop is going to be AWESOME! Thanks to Kevin Fitzpatrick of www.KMFIllustration.com for the artwork!!! 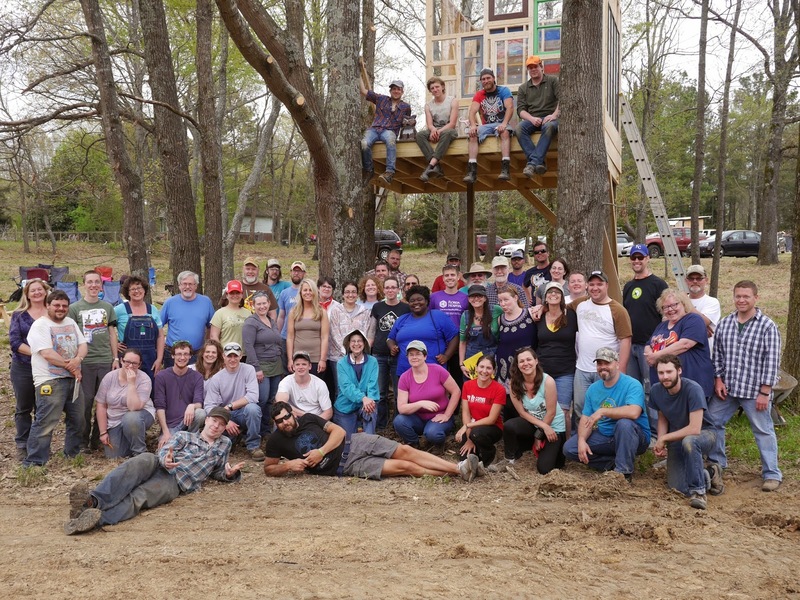 So we JUST completed our SOLD-OUT Memphis, TN Tiny House Building and Design Workshop (fully Hands-On), and the weekend was so much fun, and the response and reviews were so good, that we kept getting asked "When will the next workshop be??" We even have a few attendees from the last workshop who want to attend again- surely a good sign that we're doing something right and that these workshops are a heck of a lot of fun. SO… August 15th, 16th, 17th, and the 18th, we're having another extended weekend hands-on workshop…. this one being FOUR DAYS LONG!!! 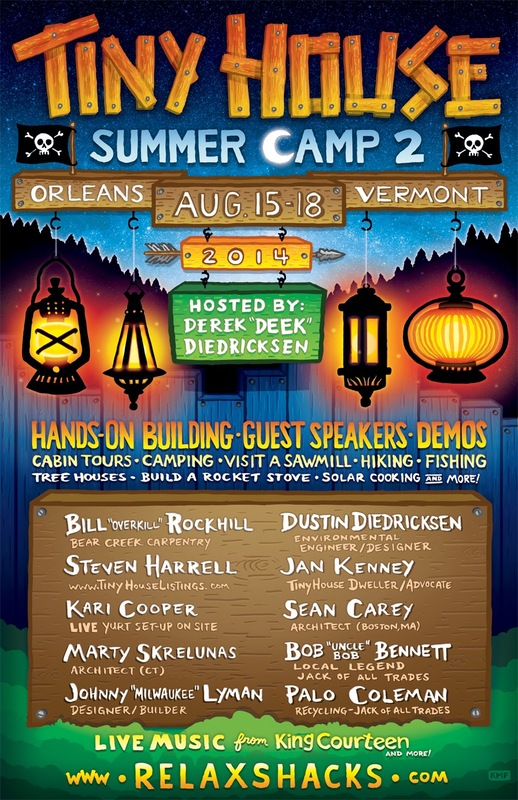 Hosted by Derek "Deek' Diedricksen, with Dustin "Dr. Demolition" Diedricksen- who have built, hosted, and designed for HGTV, The History Channel, The DIY Network, The WB, and Beyond. WHERE: My camp up in Northern Vermont. Its a 10 acre spread, off-grid, and in a pretty darn gorgeous locale…. Right near Orleans, VT. Rated one of THE BEST night skies in the US, there are micro breweries nearby, a few colonial covered bridges, and so much more…. There are trails to hike right from our doorstep, a river to swim in, an off-grid solar log cabin we'll get to tour, cabins of mine you'll tour (and even have the option to stay in), a tree house on the premises, a big ole bonfire pit ready to be used for our nighttime discussions and speakers, a local mom n' pop sawmill we'll tour, and so much more. 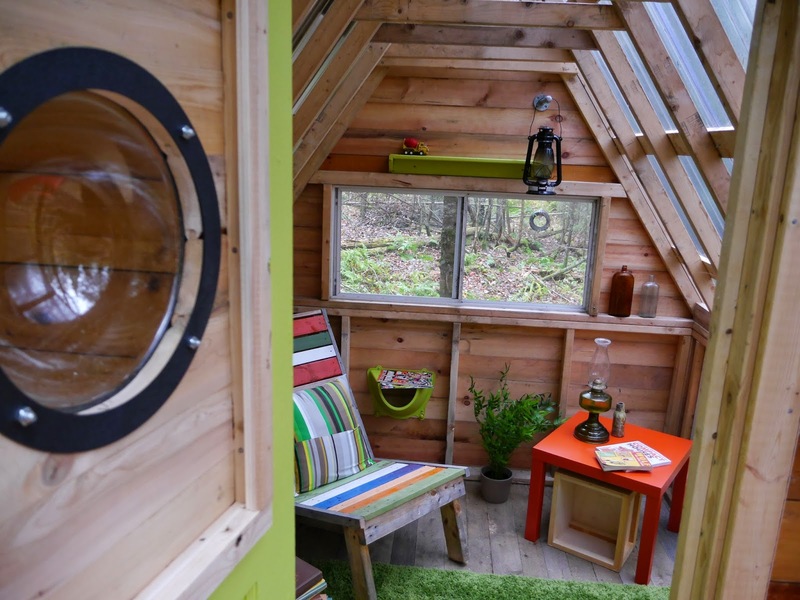 The Main Cabin (mostly built with hand tools and recycled materials). You have an option of staying in this cabin, AND it has an added 12' by 20' "classroom" or hang out space, in case we get rain. Additionally, here's a video that ran on Vermont NPR/VPR, and on Make Magazine, put together by Jon Kalish from our workshop in 2012- This will give you a feel for the property- which now has more cabins n' funky features! Workbooks, materials, and a good many tools and supplies will be provided, as will space for camping on site (included). We'll have an included huge pizza party mixer night one as well. We're also thinking of doing an off-grid "horror movie in the woods" night- on a projector… we'll see… so many options!!! There are also nearby rental cabins (very reasonable), or you'll have to option to stay in one of our many mini-cabins for a small fee- if you choose. We'll also have a solar cooking demo, and many VERY FUN recycled-material construction projects. AGAIN, there will be much more announced soon, but for those who have been asking (we had to turn away 38 people at the last workshop), I figured I'd post this early registration. The 4 day- 30+ hour course is $399- included camping spots are first come, first serve. There is also a very affordable option to rent tree house, cabin, and log cabin spots…. Space is limited. This workshop WILL SELL OUT. EVERY PAST ONE HAS…. Here's an OLD SCHOOL VIDEO TOUR of another one of the cabins (which is VERY different looking now, with an addition (where we host class if it rains), AND we might soon install several bunks for guests…. 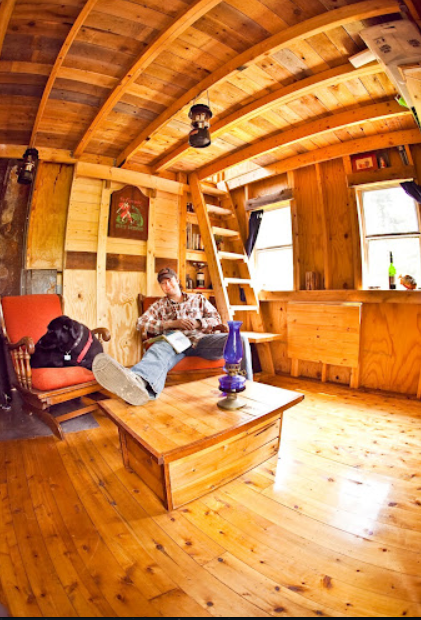 Deek, David Stiles, and Joe Everson team up on a "Transforming A-Frame Cabin"
A $2000 Two-Story A-Frame Cabin…. OUR Book "Humble Homes, Simple Shacks"